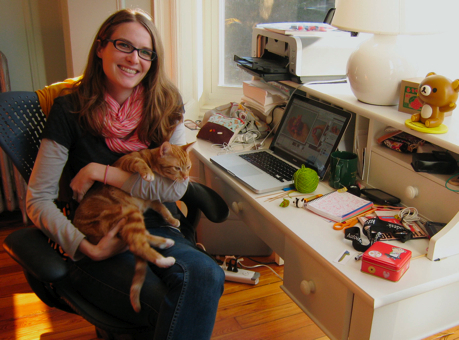 On this episode of the podcast you’ll hear from Anna Hrachovec, a 29-year-old Brooklyn-based artist who really knows how to bring her knitting to life. 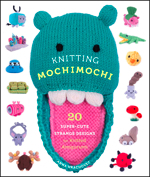 The author of “Knitting Mochimochi: 20 Super-Cute Strange Designs for Knitted Amigurumi,” Anna has gained a reputation for knitting humorous and quirky designs from pigs with wigs to intricately detailed knitted landscapes. Anna says her fun designs are influenced by childhood exposure to Dr. Seuss books and time spent living in Japan where “cute” is a celebrated part of the culture. Anna is featured in the first issue of CraftSanity Magazine along with her super cute Teeny Tiny Mochimochi Snowmen pattern. (Who knew it was possible to get addicted to knitting tiny snowmen on size 1 needles?) 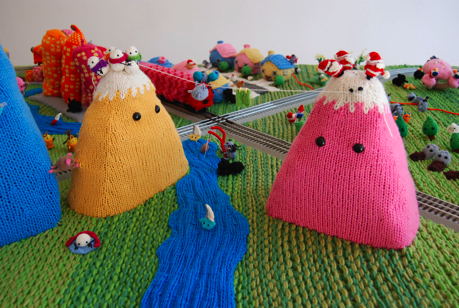 Tune in to hear her story and find out what would lead a woman to knit a bunch of lemmings jumping off a cliff and other fascinating tales from Mochimochi Land. And be sure to visit Anna in Mochimochi Land and get in on the free pattern with purchase holiday deal she has going through Jan. 2. You get a free Teeny-Tiny Mochimochi Santa PDF pattern with every purchase of $5 or more from the shop on her website. So go check it out. A Special Thanks to Episode 122 Sponsor: County Sheep Farm! Counting Sheep Farm is a family operated farm featuring registered Cormo, Icelandic and Finn sheep, dairy cows and honey bees. Visit countingsheepfarm.etsy.com to shop a lovely selection of hand dyed fiber and yarn directly from the flock of sheep on this White Cloud, Michigan farm. They also make handmade soap and raw unprocessed honey. Sponsor an episode or check out my etsy shop to snag a copy of the new CraftSanity Magazine and see my handmade line of wooden peg looms. I’m still learning from you, as I’m trying to reach my goals. I absolutely liked reading all that is posted on your website.Keep the posts coming. I enjoyed it! Thank you for another informative web site. Where else could I get that type of info written in such an ideal way? I have a project that I’m just now working on, and I have been on the look out for such info. Hello, Neat post. There’s a problem with your site in web explorer, might test this… IE nonetheless is the marketplace leader and a good part of people will leave out your excellent writing because of this problem.